While we have over 200 singing members, we are available to hire in many different configurations – from our 16-piece Ensemble (more information below) for weddings, product launches, awards ceremonies or broadcasts, up to the full Chorus for community events and bespoke performances. Let your imagination run wild! Take a look at the examples below to give you an idea of what we can do for you. And when you’re ready, fill in the form on the right and we’ll find the right group for you at a competitive price. Live music can lift any occasion. From carol singing to popular classics, the London Gay Men’s Chorus are experts at getting the party started and wowing crowds with our vocal gymnastics and infectious energy. Regardless of your budget, we can help! Want to walk down the aisle in style? Then hire the London Gay Men’s Chorus to add a unique touch to your special day. We have an experienced ensemble with a large back catalogue of repertoire for you to select for your ceremony. 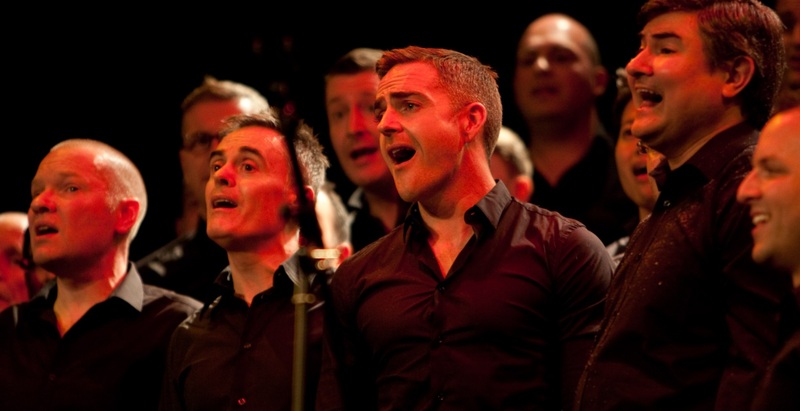 Whether you’re launching a new product or initiative, or simply entertaining your guests, the London Gay Men’s Chorus can provide an group of singers custom-made to your needs. Previous clients include Societe Generale, Herbert Smith Freehills and the NSPCC. The London Gay Men’s Chorus can put on a show for you! If you’d like to hire us for a full performance, then get in touch. We can perform a selection of repertoire to accompany a sit-down meal or a full concert performance in your choice of venue. Alternatively, we can perform a flashmob for a surprise proposal, or maybe some musical entertainment for a private garden party? We’re always open to offers – just ask! The London Gay Men’s Chorus has an experienced ensemble that can quickly learn a range or repertoire to accompany guest stars on television or radio, or perform as a group in their own right! Previous clients include BBC One Show (accompanying Dolly Parton), BBC Children in Need and The Graham Norton Show. The London Gay Men’s Chorus can provide a group of singers to sing musical interludes during awards ceremonies. Much more exciting and bespoke than recorded music! Previous clients include the Women In Film and TV Awards as well as the Radio Times Covers Party, and the 2016 GQ Men of the Year Awards. Our LGMC Ensemble (also known as the LGMCe) is a smaller group of experienced singers, made up of around 16 members of the main Chorus who audition to become a member of the Ensemble. Experienced and talented performers, the Ensemble has a large range of repertoire for a range of events, and can quickly learn new material if required. The Ensemble deliver incredible close harmony performances for corporate events and awards ceremonies – as well as performing their own shows. A secure location will be needed for singers to keep their belongs before and during the performance and for warm-up.